I know of a few people who have studied or are pursuing higher studies in the UK. From what I've seen in their photos, it's a beautiful place. A friend told me you could flash the camera anywhere—in London, for instance—and the shots would look terrific every time. And then, of course, there's the irresistible English accent. A couple of days ago, Kuya Myk Cabigon, the best Kalayaan dormitory resident assistant who has ever lived, asked me to invite friends to this event: the Education UK Exhibition on 4-5 March 2011. This is one of his major projects in the British Council. Admission is FREE! Scholarship information will be available at the British Council booth. Get a chance to win an iPad! 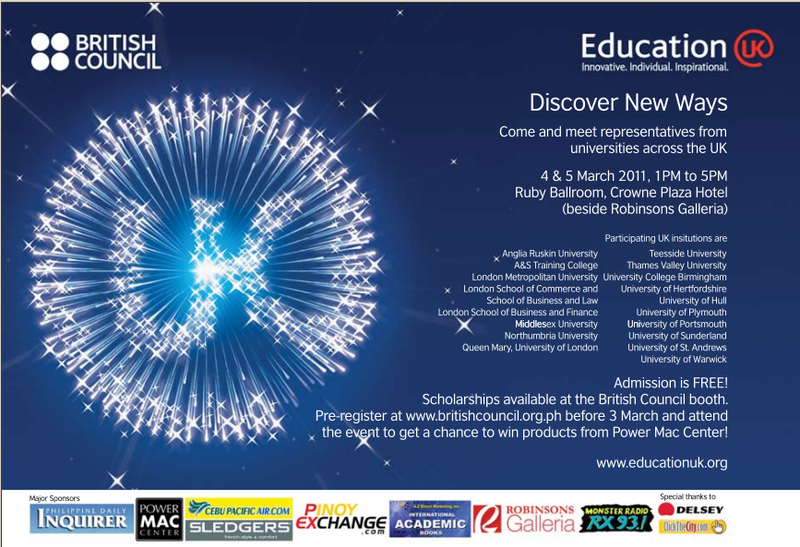 Just pre-register at www.britishcouncil.org.ph and attend the event. That ends the bloody ad, mate.